The figure used for this unit is a Star Wars figure from the Imperial Entanglements set. Its model number and name are 34/Logray, Ewok Shaman. Being an Ewok Hero, Logray may benefit from the Ewok Hunters' EWOK HERO BONDING turn bonding special power. Being a figure who follows the Independent faction, Logray may benefit from Jabba the Hutt's UNDERWORLD CONNECTIONS turn bonding special power. 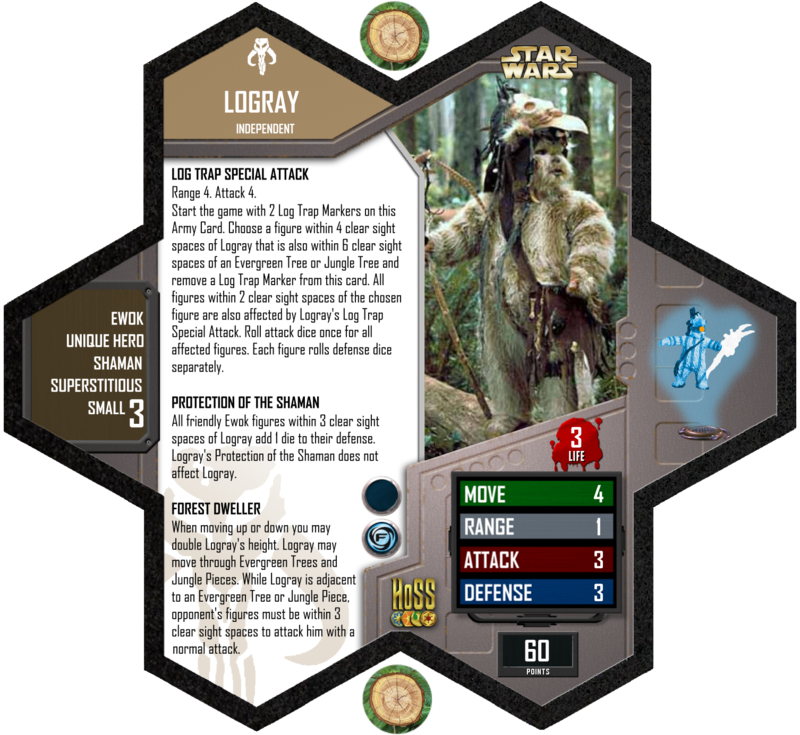 Ewoks may benefit from Logray's PROTECTION OF THE SHAMAN defense boost special power. Current Ewok units include: Ewok Glider, Ewok Hunters, Ewok Scout and Wicket. Last edited by Porkins; October 2nd, 2017 at 05:20 PM. Start the game with 2 Log Trap Markers on this Army Card. Choose a figure within 4 clear sight spaces of Logray that is also within 6 clear sight spaces of an Evergreen Tree or Jungle Tree and remove a Log Trap Marker from this card. All figures within 2 clear sight spaces of the chosen figure are also affected by Logray's Log Trap Special Attack. Roll attack dice once for all affected figures. Each figure rolls defense dice separately. All friendly Ewok figures within 3 clear sight spaces of Logray add 1 die to their defense. Logray's Protection of the Shaman does not affect Logray. When moving up or down, you may double Logray's height. Logray may move through Evergreen Trees and Jungle Pieces. 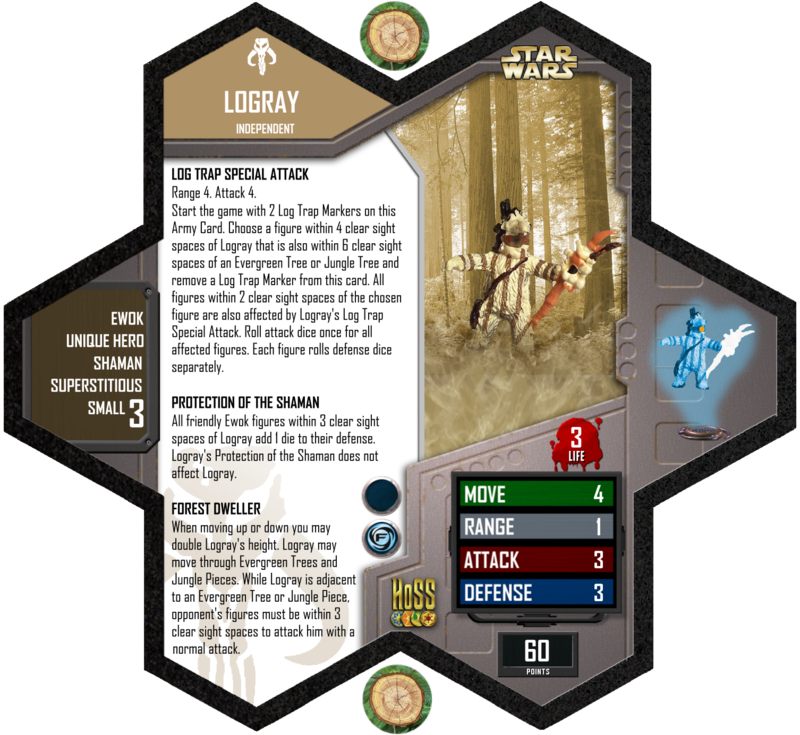 While Logray is adjacent to an Evergreen Tree or Jungle Piece, opponents' figures must be within 3 clear sight spaces of Logray to attack him with a normal attack. Last edited by Porkins; May 4th, 2016 at 12:41 PM. I love that this guy has double-bonding potential, allowing him to fit in completely different builds.